It doesn’t seem that long ago I was stuffing zucchini in the kitchen with Mom, yet it almost feels like a lifetime. One of the reasons for the radio silence here at the blog is because my mom passed away on May 28, at the age of 90, and as you can imagine, I needed to take a break. 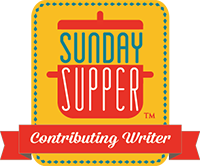 Jumping back in with #SundaySupper, which she loved, and making one of her favorite recipes seemed like a fitting way to honor her. This is how the original recipe appears in her personal recipe book. It’s funny how old recipes have such a lack of detail! Traditionally, after preparing the salad, she’d spread a thick frosting of mayonnaise over the top. As you can see, I skipped that step. 🙂 The end result here is a simple mac salad, with a light coating of mayo, the slight tang of vinegar, and dotted with chopped black olives and diced pimentos. Dotted with chopped black olives and diced pimentos, this simple, yet classic, macaroni salad is a throwback to the past. In a large pot, bring 4 quarts of well salted water (add about 2 teaspoons) to a boil. Add the macaroni, and return to a boil, cooking for about 9-10 minutes or until the macaroni is cooked firm to the bite. Rinse with cold water and drain thoroughly. Toss the macaroni with the olive oil and vinegar in a large bowl. Add the pimentos. Reserve about 5 olives, then chop the remaining olives, adding them to the macaroni mixture. Add the mayo, salt and pepper, then stir until the macaroni is thoroughly coated with the mayonnaise, and all the ingredients are mixed in. Chill, then sprinkle with paprika (if desired) and remaining olives before serving. Let’s see what the others are bringing to the party! 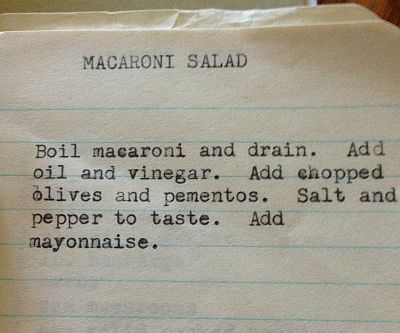 Gotta love family recipes, and this looks like a winner. LOVE IT! I very fitting way to honor you mom, she sounds like my grandma, you would always find her in the kitchen, and her recipe looked much like the one you have pictured above but were, in fact, much more detailed. You just had to know the person who made the recipe in the first place and have it handed down to you from them. Grandma made many salads and other dishes for bar-b-ques and potlucks as I’m sure your mom did, and they were always crowd favorites. I hope you’ll bring this delicous recipe to my recipe link party The Yuck Stops Here to share with us. You can find this weeks party starting this Tuesday evening at 8pm ET on my blog Hot Momma’s Kitchen Chaos! Hope to see you there & HUGS! YUM! I have a few of those typed cards in my recipe box too. I love family recipes. Thanks! I LOVE this recipe! All BBQs must have a macaroni salad! What a wonderful way to honor your mother. 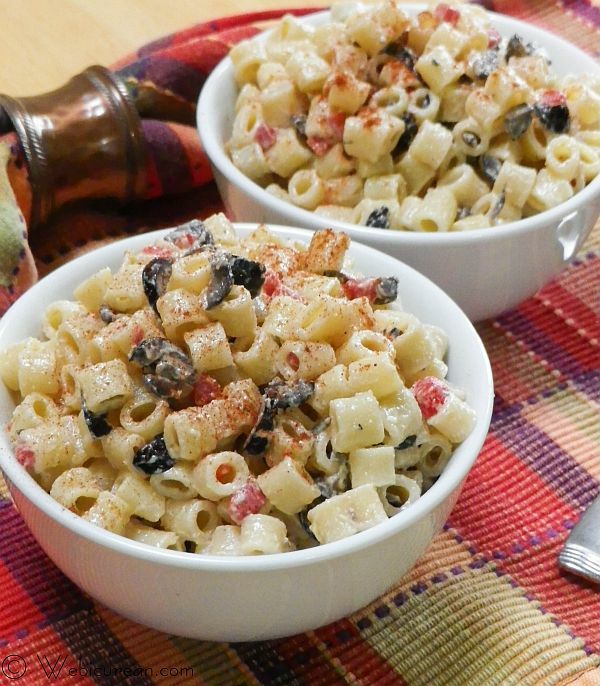 It looks like a fabulous macaroni salad recipe! 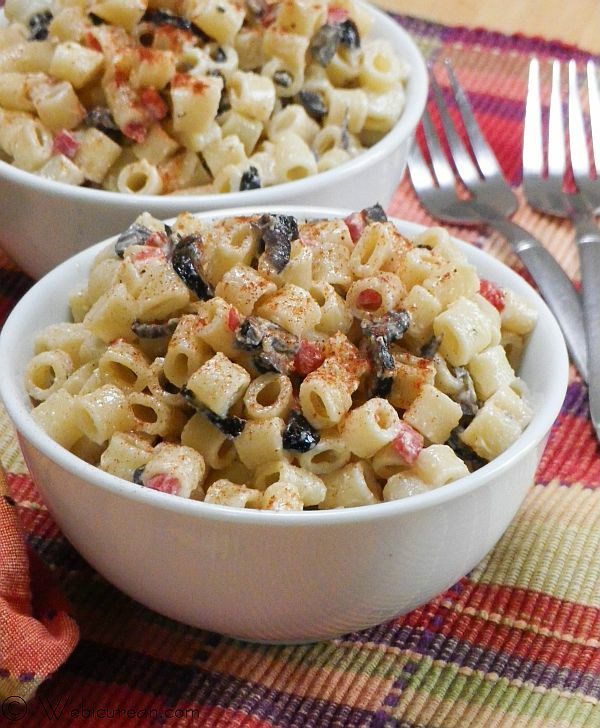 Nothing better than a classic macaroni salad for a summer day!! Yours looks great!! I sure wish my mom put black olives in her macaroni salad! What an awesome idea! What a great option! I’m so used to mac salad being super sweet. I’m so sorry for your loss, Anne. What a touching tribute your your mom. So sorry to hear about your Mom. I love that you’re honoring her with this salad that you’ve made your own! It looks great! Why hello! I’m stopping over for the first time from Sunday Supper, and you read my mind about one of my favorite BBQ side dishes. You tell a truly amazing story through this simple recipe. I’m really sorry to hear about your Mom–but it’s inspiring to see how you’ve carried on with her love for great food and great stories. Thank you for sharing! It’s great to meet you here, and I can’t wait to see even more awesome things in the future! What a terrific way to honor your dear mom. I’m so sorry to hear of her passing. Sending you a big hug. I’m so sorry for your loss. Thank you so much for sharing her recipe with us. That is such a sweet way to honor her! I seriously love the simplicity of how the original recipe is written. We sometimes over write our recipes but I know I do because sadly these days so many people weren’t taught how to cook so something as simple as cooking pasta is a big feat. I have a cookbook filled with family recipes like this 🙂 I love how simple they care. Sometimes I have to call my grandmother who made it and ask exactly how to do it sense there isn’t much description. This looks like a tasty mac salad though ! Consequently mouth watering! That appears to be irresistible! It's a #SundaySupper Summer BBQ Party!